For the last three weeks I've posted (Chad too) blogs with a Halloween theme. I think most of the have had some sort of scary or creepy theme to them. I'm going to switch gears for a bit and talk about some of the silly costumes worn in the wrestling business. There are plenty to chose from, so this should be interesting. I'm beginning this series with Mantaur. For those who may not remember, he was a WWF superstar in 1995. Remember, this was a down time for the company. Hulk Hogan and Randy Savage had left and in my opinion the WWF was still looking for ways to fill the void. This was also the era of TL Hopper, Freddie Joe Floyd, and Duke the Dumpster Droese. So when Mantaur came hoofing his way to the ring in January of that year, it seemed like par for the course. Wrestling has always had an interesting mix of characters in crazy costumes. I'll run down some more of them in future posts. 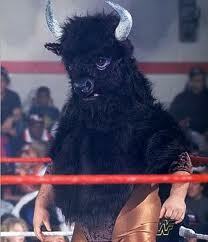 Mantaur's gear consisted of an actual bull head that he wore to the ring. He didn't wrestle in it, thank goodness. But it was quite the site. 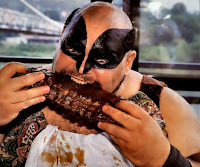 Mantaur never really achieved any big success in the ring, even though Jim Cornette managed the man-beast. He lost to Razor Ramon one time by disqualification during an Intercontinenal title match. Mantaur went on to job to Bob Holly in a qualifying match for the King of the Ring tournament in 1995. 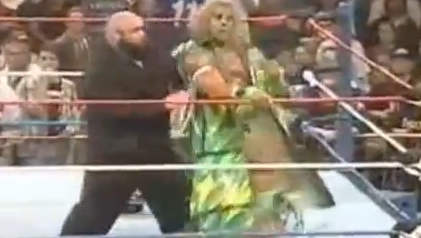 The man behind the hooves and horns, Mike Hallick returned to the WWF in 1996, this time as the bodyguard of Goldust. I had forgotten about this, actually I didn't even realize it was Mantaur in the suit. I'm pretty sure this was a one time gig though. He got beat up by the Ultimate Warrior at the In Your House in April of that year. So for his big bull head, hooves, and brown tights; Mantaur makes the list of wrestling's most outrageous costumes. Think I'm full of bull? Post your thoughts here or on Facebook or Twitter.